Spray Foam Insulation - MGT Insulation, Inc.
All spray polyurethane foam (SPF) insulation products are not created equal. That’s why we use premium, energy-efficient foam products that can be applied with precision almost anywhere. Our premium spray foam expands to completely fill gaps and spaces with a long-lasting solid product. No matter how irregular the shape or how rough the surface, our premium foam products create an exact fit and an effective, high quality air barrier that lasts. Spray foam insulation will help you and your home conserve energy, increase your comfort and lower your heating and cooling bills. Spray foam insulation is a combination of two composite materials: polyol resin and isocyanate. When these materials are mixed together and sprayed through the tip of a spray foam gun, they expand and harden creating a solid layer of either open-cell or closed-cell insulation. Open-cell spray foam’s cell structure is more porous and is used for interior projects only; used to enhance sound deadening and is vapor permeable because it acts like a sponge and soaks up and holds water. Closed-cell spray foam’s cell structure consists of gas bubbles that are permanently locked into place and water cannot pass through. Closed-cell spray foam insulation is used for interior and exterior environments and used to increase structural strength and to decrease vapor transmission, making it an ideal and powerful insulator and vapor barrier. 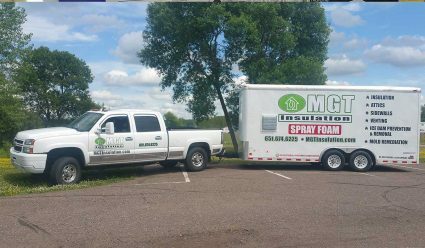 MGT Insulation specializes in closed-cell spray foam insulation. Where is Closed-Cell Spray Foam Insulation Used? Closed-cell pray foam can also be used to insulate garages, polebarns, outbuildings, RVs, trailers, fish houses, and deer stands, and much more. Understanding the difference between open cell and closed cell foam insulation is the most important step in determining which product is best for your next insulation project. Open Cell Foam Insulation is a porous material that can allow air and moisture to penetrate the insulation. Closed Cell Foam Insulation is non-porous with all of the voids closed to each other which makes it difficult for water vapor and air to pass through it. The porosity of the two materials is the biggest difference and most important issue. If your insulation application needs a vapor barrier then you MUST select closed cell foam insulation. Open cell foams typically weigh about 0.5 lbs per cubic foot, while closed cell foams are about 3 lbs per cubic foot. Ultimately this is why closed cell foams are stronger and denser, allowing them to carry heavier loads. This is also one of the reasons that closed cell foam is quite a bit more expensive compared to open cell foam. Open cell foam insulation typically has average R values of about 3.5 per inch while closed cell foam insulation has average R values of about 6.9. Closed cell foam insulation can have almost twice the insulating values per inch. Closed-cell spray foam insulation is the most effective insulation material on the market today. It has the highest R-Value rating of 6.9 when it is applied in a one-inch layer to bare wood and can mold itself around any obstacle. Closed-cell spray foam insulation will seal every nook and cranny wherever it is applied. Closed-cell spray foam insulation is applied in a one-inch layer and acts as a vapor barrier to prevent moisture from damaging the building. When closed-cell spray foam insulation is applied to the walls, ceiling, foundation, basement, or crawlspaces of buildings, it improves the building’s durability and creates structural integrity. When closed-cell spray foam insulation is applied, it creates an airtight seal, causing less heating and cooling loss from your home and can dramatically reduce your energy bill.